Fresh Faces Poland is the world’s most exciting modeling contest, where new faces who want modeling opportunities become international models! The contest collaborates with famous model agencies and top fashion photographers, who seek new model talent for modeling contracts and photo shootings. One more year we’re very excited to announce that the modeling contest Fresh Faces Poland who was organized by Magteam Model Management has almost come to an end! 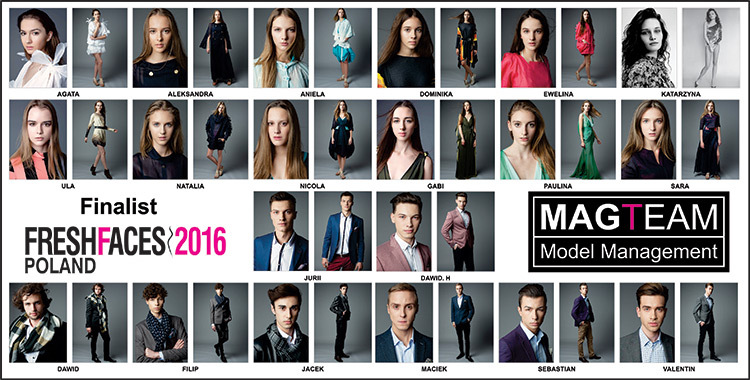 During the Semi-Finals the Jury selected the best male & female models who will get a spot in the Polish Finals! Aleksandra Przybyła, Fresh Faces Poland winner from the previous edition was seen on the covers of prestigious magazines and at the runways of the biggest fashion shows! This year’s winners will go on a trip to NYC and visit the largest modeing agencies. A great opportunity for their modeling career! Winner will be future on cover of HOT Moda Magazine in Poland. Other finalist will also get a professional photo shoots and other prizes which are donated by sponsors and partners of the Fresh Faces Poland 2016 contest!